To some degree or another, pretty much any fruit or vegetable is healthy, which is why it is so important to include a wide variety of them in your diet. Asparagus is one of those vegetables that you really should be including, especially as it is a key source of antioxidants while also offering other beneficial compounds from plants. However, if you don’t eat asparagus regularly it can seem a little bit confusing. After all, there are so many different ways to cook asparagus and it can seem difficult to figure out how to get the vegetable tasting just right. Some of the different ways to cook asparagus include baking, steaming, sautéing, grilling, blanching and even deep frying, as well as a large range of other approaches. That all might seem a bit overwhelming, but that’s where recipes come in, right? I love food bloggers for this reason. There are so many different blogs out there where the authors develop amazing recipes for just about every food type you can imagine. These recipes are perfect if you’re trying to figure out how to cook a specific type of food (like asparagus) or if you’re trying to find something unusual for a meal (like looking for healthy breakfast options). To save you effort, this post highlights 26 of my favorite asparagus recipes from bloggers across the internet. These recipes highlight different ways to cook asparagus and range from simple dishes to recipes that are much more complex. You might find some recipes more appealing than others, especially if you are on a specific diet type. For example, the pasta-based dishes won't work well for someone following a low carb or a ketogenic diet. Still, you should be able to find some options on this list that work for you regardless of your diet type or eating preferences. Besides, despite the differences between the recipes, they all have one thing in common – they’re bound to taste wonderful. ​I love this recipe for Asparagus, Goat Cheese and Basil Omelet, partly because I love the idea of omelets to start off with. Now, eating breakfast every morning certainly isn't a necessity, but for those of you that do, omelets seem like one of the best ways to start off the day. This particular omelet recipe combines flavors of goat cheese and asparagus, which is certainly unique. I've never tried this pair of flavors, but I think it would work pretty well, especially because you are also getting flavors from the basil and the eggs at the same time. ​Speaking of breakfast and eggs, this Baked Asparagus Frittata is another recipe that gives you a way to have asparagus first thing in the morning. This is also another recipe that uses goat cheese, so there must be something about goat cheese, eggs and asparagus that I simply wasn't aware of before. This recipe is also pretty cool because of the way it looks when it's all completed. Personally, I think the dish just ends up being stunning. ​Asparagus might make a good breakfast food, but there are also a lot of other options for eating it. This Asparagus and Pea Soup is one example of this and you could have the dish for lunch or dinner easily. The recipe has a few cool things going for it, including the way that it uses coconut as part of the flavor and the fact that it is a vegan recipe. While an asparagus and pea soup does seem to be a relatively common type of recipe, the choice of coconut does add an additional depth to the recipe that you simply wouldn't find elsewhere. ​Asparagus works great as the feature ingredient for a dish, but that certainly isn't the only way to use it. In this Grilled Potato Salad recipe, the asparagus isn't featured at all and in some ways it almost seems like an afterthought. Don't let that put you off though, as asparagus makes a fantastic flavor addition to the dish as a whole and helps make the potato salad that much more interesting. Besides, you have to admit that the potato salad really does look amazing. Potato salads are one way to use asparagus, but this Lemon Asparagus Pasta Salad is certainly another approach. ​I'm a big fan of the flavor combination with this salad, especially because you have cucumber and feta in the mix along with the asparagus and lemon. To me, this feels like a very summer-like salad and the dish does also look especially fresh and vibrant on the plate. The recipe also seems to be a popular one, which is one more reason to give it a try. This recipe was simply titled Perfect Asparagus ​and it's easy to see why. Unlike most of the recipes on this list, this one isn't about flavor combinations at all. Instead, the recipe focuses entirely on technique, teaching readers how to cook asparagus perfectly. Of course, there are many different ways to cook asparagus and this particular method just focuses on one, boiling. Still, it's the perfect place to start if you're not that familiar with cooking asparagus. 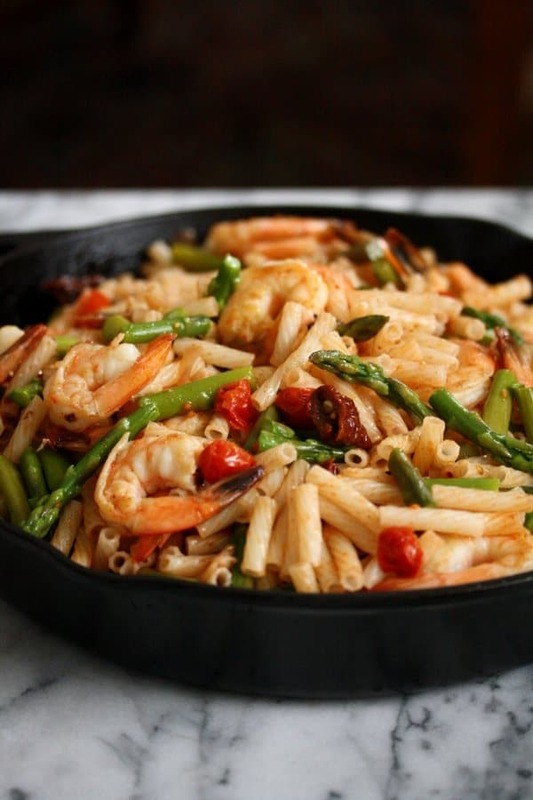 I've mentioned a few different types of salads that use asparagus, and this Spicy Shrimp Pasta Salad is another example. ​In this case, the main flavors of the dish seem to come from the sauce and from the shrimp, but the flavors of asparagus do still play a key role. This is also a dish where asparagus is especially important because of the color. I find that the asparagus stands out particularly well when compared to the rest of the dish, making the whole thing look great. ​I'm a big fan of this Salmon and Asparagus in Foil for a few different reasons. The first is that the recipe is so simple to prepare, but it doesn't compromise on flavor. Simple recipes can be great for the times that you are running short on time or on energy. The recipe also doesn't make much mess, which is great when it comes to cleanup. But, the thing I like the most about this recipe is that it also offers a perfect way to get salmon into your diet. Nutritionally, salmon really is important and baking it in foil is always a good way to cook the fish without worrying about it drying out. Without a doubt, my favorite thing about this A﻿sp﻿aragus and Ramp Soup is the colors​. The creator of the recipe did a great job of making something that really looks too good to eat. Nevertheless, the soup is designed to be eaten and you don't even have to make it look quite this pretty if you don't want to. Interestingly, the recipe actually includes steps for the soup itself and for the spelt bread that you see in the image. That gives you the option of making both parts or just making the soup - depending on how you feel about spelt bread. We are talking about different ways to cook asparagus, so this Garlic Butter Sauteed Asparagus fits in nicely with that theme.​ I really love the way that this recipe is extremely simple, yet it still has a pretty intense flavor. Besides, the flavor of garlic butter tends to be pretty appealing on any dish, including vegetables. This recipe might also work well as a way to get kids to eat asparagus as the flavor from the garlic would overwhelm some of the natural taste that comes from asparagus. This Blanched Asparagu﻿﻿s offers another variation for how you can cook asparagus - and again the recipe is a fairly simple one. This is also a recipe that is as much about the technique used to make the dish as it is about the flavors themselves. However, the Lemon-Dijon Vinaigrette that is served with the asparagus is a good way to add in a bit of flavor without making the recipe too complicated. This Asparagus and Tofu Noodle Salad looks interesting visually, partly because the recipe is inspired by Asian meals. In the recipe, the creator noted that one of the key aims was to highlight the flavor of asparagus, so all of the other flavors act to complement asparagus, rather than trying to drown it. I think the dish would be a good choice for anyone who wants to experiment a little and it would a fun option for a light lunch that is still fairly high in protein. ​Wrapping asparagus in meat and grilling it seems to be a pretty popular approach. Part of that probably comes from the simplicity of the method, although I imagine the combination of flavors is also a major part of the appeal. With that in mind, this Grilled Prosciutto Wrapped Asparagus is pretty much exactly what it sounds like, although the recipe is also a good way to learn the techniques of grilling asparagus. Besides, the technique is certainly healthier than making bacon wrapped asparagus. Most recipes for wrapping asparagus in meat seem to focus on prosciutto (like the recipe above)​ or on bacon, but that isn't always the case. This Stea﻿k Wrapped Asparagu﻿s recipe is one example of how you can make an entirely different dish using a different type of meat. Now, red meat does tend to get a bad rap, but it's actually surprisingly healthy and would also pair really well with flavors from the asparagus. This recipe might not be everyone's favorite way to eat asparagus but it would probably be popular among anyone who loves their red meat. ​In general, quiches can make a good breakfast or lunch and sometimes they're also a good way to cram vegetables into your day. This Asparagus, Spinach and Feta Quiche is an example of this. After all, you are getting asparagus and spinach in from the same recipe. That has got to be good for you. Now, the feta cheese might not be as healthy as an addition, but personally, that is what makes the dish so interesting. Feta cheese works well in a lot of recipes because it has a sharpness to its flavor that really makes it stand out. I love the idea of using this along with the eggs, asparagus and other ingredients in this recipe. Speaking of feta cheese, ​this Lemon Grilled Asparagus recipe is another one that takes advantage of the sharpness of the cheese. The overall flavor choice for this recipe might seem a little bit unusual at first but the recipe does seem to come together really well. The cheese also melts a bit, which would help it to stick to the asparagus somewhat. Still, I suspect that this particular recipe might be a little bit messy to eat. Then again, sometimes messy food can be fun. Just about every other recipe I found online used asparagus as spears or chopped those spears up, but this recipe takes an entirely different approach. The name Shaved Asparagus Salad pretty much speaks for itself and the recipe is basically a salad that uses strips of asparagus as the greens instead of more traditional options. The approach is also a little bit unusual because the asparagus is raw. Even though raw asparagus isn't used all that often, it can actually offer an interesting flavor and can work well with salads - as this recipe shows. A second example of using asparagus as-is is this Raw Asparagus Caesar Salad​. This time, the asparagus is not shaved, but cut into smaller pieces. Visually, the salad looks appealing and it would be easy to make because you are basically just tossing asparagus pieces in a dressing that you make. However, the dressing itself does sound pretty good and it would combine well with the flavor and the texture of raw asparagus. This recipe is another example of an Asparagus Soup with Ramps​, although this time mushrooms are also used as an ingredient. This version of the soup isn't vegan, so it might be a more appealing option for anyone who likes dairy products. The creaminess of the soup come from cottage cheese and from milk, which makes this a pretty appealing soup overall. This Indian-Spiced Chicken and Asparagus was ​a recipe that I originally found at Carnivorous Vegan, although the original version comes from Eating Well. I love the concept of this recipe, because it's surprisingly simple to make and you end up infusing the asparagus with Indian flavors along with the flavors from the chicken. This is also a recipe that you could make pretty easily using just a single pan, which is always great when it comes to cleanup. I was pretty excited to find this Warm Farro Asparagus and Poached Egg recipe​ just because of how unique it is. If you're not aware, farro is another alternative type of grain that is nutritionally dense. You would use it in a similar way to quinoa, even though it isn't nearly as popular. Regardless, this recipe looks like it would make a great dinner, lunch or breakfast even. It's also another recipe that has you eating strips of raw asparagus - so it's a great way to give that approach a try. This Baked Asparagus recipe ​offers another alternative approach for baking your asparagus. Out of all the different ways to cook asparagus, baking does seem to be a pretty common one, probably because you can just leave the asparagus to do its thing once you have it in the oven. Plus, baking asparagus gives you the chance to cook a lot of the vegetable at the same time, which is especially relevant if you are cooking for a party or just for guests. I'm particularly fond of this recipe because it ends up looking great visually and it's easy to do. Earlier on I mentioned one example of this type of recipe and this Lemon Asparagus Pasta follows a similar concept, although the actual recipe is quite different. For one thing, this recipe also includes chicken, which acts as an important source of protein. At the same time, this recipe creates a creamy and very hearty pasta dish that highlights the flavors of the chicken, the asparagus and the lemon. Sounds like a great combination all around. This recipe for Pan Charred Asparagus​ offers an entirely different approach to cooking the vegetable. It's a particularly good choice if you also happen to be a fan of walnuts. As you might imagine from the image, the recipe itself is fairly simple and it's as much about technique as it is about ingredients. This way of cooking asparagus seems like it would work quite well. However, you do need to have a pretty heavy duty skillet to make the recipe work. ​This Asparagus and Pea Soup is a vegan and gluten free soup recipe, which would make it appealing to a wide range of people. The recipe also uses an interesting combination of flavors, including garlic and onion to make the dish that much more interesting. The finished product also ends up looking pretty good in the bowl, especially if you choose the same garnishes that the recipe creator used. To close off our list, here is one more recipe ​you can use for asparagus. Not surprisingly, the main ingredient for this Quinoa with Asparagus and Parmesan is the quinoa itself, but asparagus does play a key role in the appearance and overall flavor of the dish. The recipe is pretty easy to make, especially if you are already familiar with cooking quinoa. Plus, as the author points out, the end product looks a lot like a risotto, although it would still end up with the nutty and earthy flavor that you find with quinoa. That flavor, combined with the asparagus, cheese and other ingredients would end up creating an exceptional dish. Thank you for such wonderful collection of asparagus recipes… they all look so delicious! Saving this to give a few a try! Glad you liked it. What were your favorite recipes on the list?